Kiwi Chick on a Mission: Four in a row - tramping fun! Four in a row - tramping fun! Recently I learned I would be physically out of action for a period of time - this was a blow as I had plans to be climbing Mt Aspiring in November and this plan would now need to be shelved. As might be expected of me, my reaction to an enforced period of inactivity was to ramp up my weekends for the remaining period with some tramping trips. As with all our trips we had several backup plans in place in case the weather didn't play ball. Plan A for the first trip was to head up to Mitre Peak in the Tararua range for a spot of snowshoeing to take advantage of a recent southerly blast. This would have been a strenuous but fun trip. Sadly the weather gods threw a curve ball with rain and gales on the tops so the trip ended up being an easy wander in to Mitre Flats hut for the night and back out the next day. 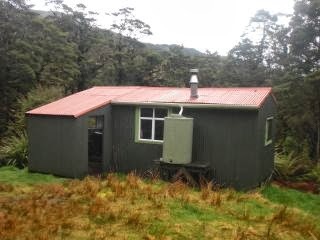 The positive for the trip was having the hut to ourselves - the previous two occasions I've been in that hut have seen an overflow situation with people sleeping on the deck and camping outside. Trip 2 went according to plan with a pretty average weather forecast being wrong and being delivered two lovely sunny days. 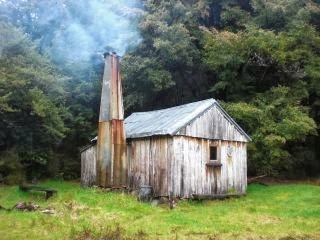 The plan was a walk in from Otaki Forks to Waitewaewae Hut (also known as YTYY or Y2YY) on the banks of the Otaki River. There had been recent activity on the long standing slip which made for an interesting few moments of near-terror as we scrambled across that. The decision was made towards the end of the tramp in to take the dry weather (wet feet) track to the hut. With scant information we headed off for that and took a bit of time to figure out that meant a walk across then up then across the river. The final river crossing was chest height in frigid water - luckily the hut is right by the bank of the river so dry clothes were soon available and the fire was kicked into action to warm us up. Again we had the hut to ourselves for the night. The walk out the next day was uneventful although the decision was made to take the wet weather (dry feet) track back out to avoid a morning dip. Trip 3 was a less than perfect weekend with low cloud and rain. Nevertheless we headed off for a short walk up to Kapakapanui Hut at the back of the Reikorangi Valley behind Waikanae. For the third week in a row we had a hut to ourselves so settled in for a quiet afternoon of reading before dinner and bed. Listening to the rain through the night we wondered how the river crossings would be on our way back out to the cat the next morning. After breakfast and packing up we headed off to walk up over the summit before dropping steeply down to the carpark. The river was a little higher than the day before but still crossable. Lucky. Would have meant a long walk otherwise. Finally we were down to my last weekend and we were lucky enough to be in the South Island. 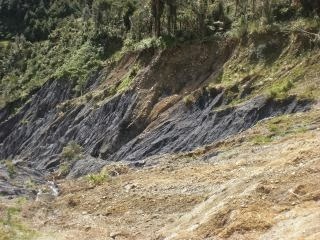 Yet another soggy forecast meant a change of plans and then a road closed due to a slip caused another change of plans. 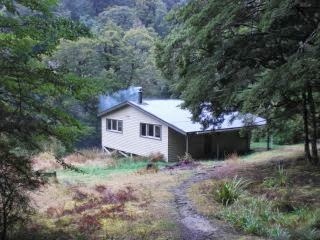 Off we headed, on the Wangapeka Track to Kings Creek Hut for a couple of nights. As with the Waitewaewae track, there was an active slip on this track. And, wow, what a slip! 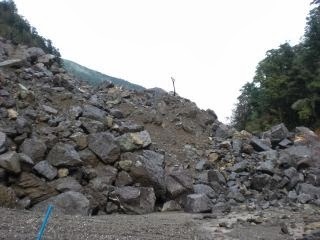 There are warning signs at the beginning of the track and on both sides of the slip advising that the slip should be crossed quickly, that spotters should be used for falling rocks etc. The slip happened in October 2012 and has partially blocked the river resulting in quite a lake behind it complete with trees that are dying (slowly drowning I guess). We got through to the hut ok and then it started raining and didn't stop. 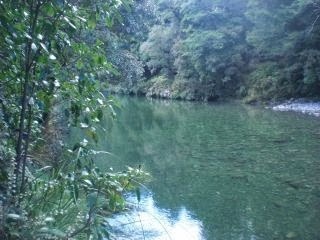 When we first arrived there we had a dip in the river. By the next morning the river was heavily flooded. Five minutes further along the track is Cecil King's old hut. Cecil was a miner who spent a lot of time in the area and his old hut has been restored and has 4 bunks available for people to stay there. It's a cool little hut with an open fire and easy access down to the river. After a couple of nights at Kings Creek hut it was time to head for home. Despite the continual rain the slip was passable. The next hurdle was a ford we'd driven through on our way to the track - it was dry when we'd driven through it on the way in. After all that rain it was flowing pretty high - lucky we had a rental car. The rain had eased off and you could see that the river level had dropped significantly. Lucky - we would have been pretty stuck otherwise. It's one of the few fords I've seen that has a footbridge alongside to allow people to exit (without their vehicle of course) when the river is high. So, four tramping trips over four weekends. In all cases we had the huts to ourselves and only saw other people on the Waitewaewae trip. Luxury! Now it's time to rest up and recuperate in time for some summer trips. Looks great - apart from the uncooperative weather! We have been watching the TV doc 'First Crossings' which shows how some of the early explores etc were done - hard yacka!